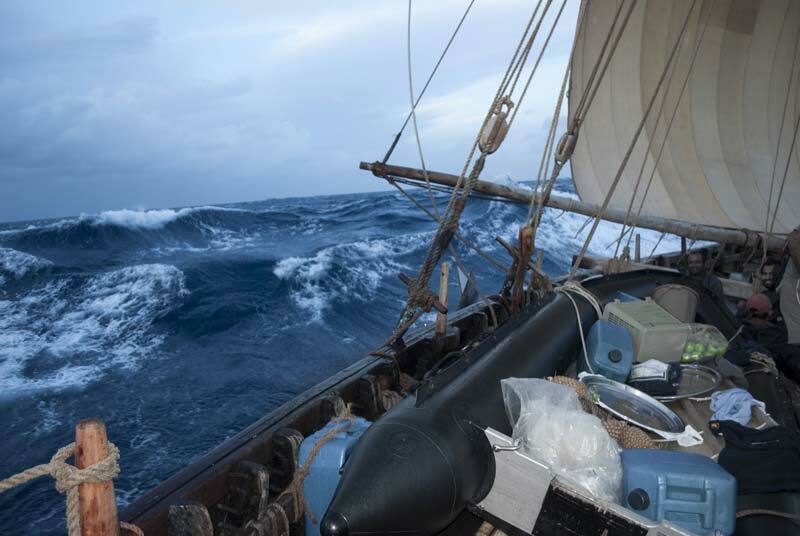 This shorter leg of just ten days should have been straightforward, but only days out from port, Jewel ran into fierce storms with winds up to 43 knots. Once the storm had passed, the crew discovered that one of the masts had cracked. But Jewel carried plenty of spare wood and rope, so the crew were able to lash beams tightly to the mast to allow her to reach Galle safely. Once there, the construction team had to search the forests of Sri Lanka for trees to make new masts for the ship, shape them and fit them. So it was to be nearly a month before Jewel set sail again for Georgetown, Malaysia, on what was to prove the most dangerous and difficult leg of her voyage. From the moment when Jewel set off on May 15th 2010 the weather began to deteriorate. For days on end Jewel was hit by a succession of squalls with winds of 35 to 40 knots and heavy swells. The conditions meant the sails had to be frequently raised, lowered and trimmed – all done in poor light or darkness with no lighting on rolling, slippery decks. In the days that followed, Jewel was battered by the edge of a cyclone swirling through the Bay of Bengal to the south of the ship. In the very worst storms, winds reached over 50 knots, with waves up to five metres high. The ship covered huge distances at great speed, at one point making a new record speed of 11 knots. Then, thankfully, the winds dropped and the crew could get some rest and a hot meal. But the weather was yet to throw one more challenge at Jewel. On the night of May 29th, during a period of very little wind, Jewel was hit by a sudden, vicious squall. 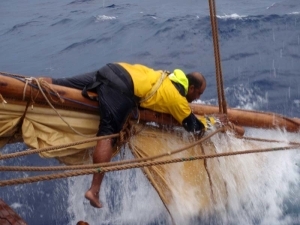 As the crew moved to lower the sails, the winds reached a sudden peak. A loud crack was heard. The crew saw that the lower yard on the main sail, a solid timber 15 cms in diameter, had snapped in two. After a desperate struggle to secure the broken yard and lower the sails, Jewel’s crew brought the ship back under control. Jewel had survived what was to be her worst moment. In the following days, in calmer weather, Jewel briefly tried palm sails as used in ancient times in place of the traditional canvas sails. They were heavier and slightly slower than the canvas sails, but they gave the crew an invaluable opportunity to experiment with an alternate type of sail no longer used today.